Novella #1. May of 1903. In the dank attic room of a squalid inn on the north coast of France, a young and penniless American woman, only recently recovered from a difficult birth, yearns for home. May God help those who stand in her way…. Though her circumstances are such that they might elicit pity, Mrs. Biddle neither needs nor wants our sympathy. Nor, after even the briefest acquaintance, are you likely to afford her any. Her yearning for home derives not from a love of friends or family, but rather a compulsion to settle a score. Haughty, arrogant, deceitful, cunning, faithless—these are the words best able to describe her. One moment she’s posing as the ruler of an underwater duchy in aid of a con game, the next she’s betraying a confederate. With never the slightest feeling of remorse. I do hope you’ve enjoyed this scrumptious sample. 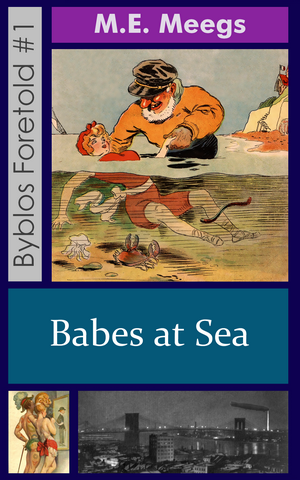 Those unable to resist a further helping will be happy to learn that Babes at Sea is on sale and awaits your pleasure.